Situated on a lake, this spa hotel is steps from Lodore Falls and Lake District. Derwent Water is 1.4 mi (2.3 km) away. Situated in a national park, this hotel is steps from Keswick Museum and Art Gallery and Lake District. Derwent Water is 1.7 mi (2.8 km) away. Situated in a national park, this hotel is within 1 mi (2 km) of Keswick Museum and Art Gallery and Lake District. Derwent Water is 1.8 mi (2.8 km) away. Situated in Keswick, this guesthouse is within 1 mi (2 km) of Keswick Museum and Art Gallery and Lake District. Derwent Water is 1.7 mi (2.7 km) away. Situated in a national park, this hotel is within 1 mi (2 km) of Cumberland Pencil Museum and Lake District. Derwent Water is 1.6 mi (2.6 km) away. Situated in Keswick, this bed & breakfast is within 1 mi (2 km) of Keswick Museum and Art Gallery and Lake District. Derwent Water is 1.8 mi (2.9 km) away. 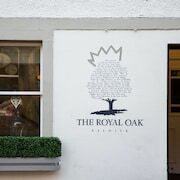 Situated in Keswick, this inn is within 1 mi (2 km) of Keswick Museum and Art Gallery and Lake District. Derwent Water is 1.6 mi (2.6 km) away. Situated in Keswick, this guesthouse is within 1 mi (2 km) of Keswick Museum and Art Gallery and Lake District. Derwent Water is 2.4 mi (3.9 km) away. Beautiful rooms all done to a high standard, and a great location too. Where to find Keswick hotels near an airport? Where can I find hotels in Keswick that are near tourist attractions? If you're vacationing in the Cumbria area and you're looking for accommodation in Keswick, you'll find a wonderful range to select from. Expedia's extensive database lists 33 hotels within a 0.1-kilometre (0.06-mile) radius of downtown Keswick. Take in the sights near central Keswick. 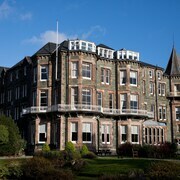 Hotels here include Keswick Country House Hotel and LakeSide House. The Keswick area offers a solid selection of affordable hotel options that will be sure to please even the thriftiest visitors. 5 kilometres (3 miles) from Keswick's center you'll find the Maple Bank. The Rickerby Grange Country House is only 3 kilometres (2 miles) away. Alternative lower-cost accommodation options include the Brundholme and the Lake View. 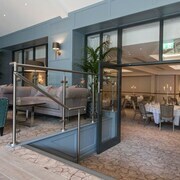 You could also check out the Gilpin Hotel & Lake House and also the Holbeck Ghyll Country House Hotel. 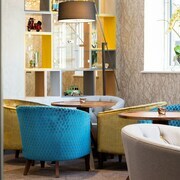 The Gilpin Hotel & Lake House is positioned 30 kilometres (19 miles) away from the heart of Keswick. The Holbeck Ghyll Country House Hotel, is located 20 kilometres (14 miles) away. 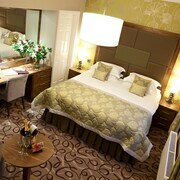 Two other accommodation options are the Windermere Suites and the Swinside Lodge Hotel. After you have got to know Keswick, you should leave time to investigate the wider region of the Cumbria area. Visit Cumbria's ruins and castles. Those who love nature could also take the time to to admire the region's beaches, coastal plains and forests. In this part of England tourists might enjoy mountain biking, rock climbing and mountain climbing. Looking for more things to do? Why not spend some time exploring Hill Top and Dove Cottage, which you'll find in Ambleside, 18 kilometres (11 miles) to the southeast of Keswick. The The Daffodil Hotel and The Wordsworth Hotel and Spa are just some of the fabulous Expedia-listed accommodation alternatives in Ambleside. 13 kilometres (8 miles) to the northwest of Keswick, you may also choose to stay at Cockermouth, which is home to the Hundith Hill and Allerdale Court Hotel. The Jennings Brewery and Crummock Water are popular attractions to see should you visit Cockermouth. Located 100 kilometres (65 miles) away from Keswick is Newcastle International Airport. Stay nearby at DoubleTree by Hilton Hotel Newcastle International Airport or Britannia Hotel Newcastle Airport. What are the most popular Keswick hotels? Are there hotels in other cities near Keswick? What other types of accommodations are available in Keswick? Explore Keswick with Expedia.ca’s Travel Guides to find the best flights, cars, holiday packages and more!